Omg, happy dancing, I am sure! My great nephew just had to have his recauterized. Hi Gwen! I just have a question about your adorable girls. Is there any particular reason why Lola doesn't smile as much as Claire? I always see Claire smiling in your pictures, but I've only seen a handful where Lola does. Just something I was curious about. Just checking to see how being gtube free is going. Hopefully quite well! Is she able to eat or still on liquid? @Celeste -- Thanks for writing! You are right -- Claire smiles more than Lola. I don't see either show true social smiles, but Claire has her own little smile that is pretty close. She can kind of do it on command & at times seems to do it almost socially appropriately. However, Lola isn't capable of doing this yet. She will sort of grin when I undress her (tickles maybe? Or reflexive?!) & sometimes when I zoom her around or gently toss her in the air. I hope someday she'll be able to smile more! 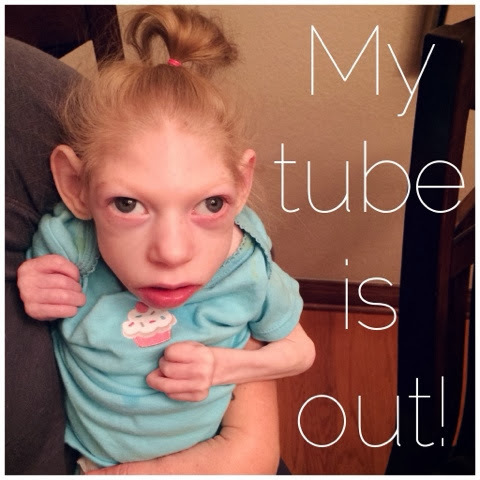 Lola is doing well with her tube out. SO glad she is feeling better! And yes, Claire is working on standing in PT & it's tough for her & she can only do it for short periods of time, but she is rockin' it! SO PROUD!!! Hello! I have recently found your blog, and I have a question for you. Have you ever considered giving your daughters Omega-3 supplements? Omega-3s are known for improving memory and overall brain function, but recent studies are now showing it can actually aid brain-damaged patients in brain regrowth in larger doses! Since both of your daughters have Microcephaly, maybe it can help their brains grow too? Healthy fats and sugars are also good for the brain too. @Anonymous -- Yes, we do Omega-3 supplements for the girls. Currently trying to find one that Lola can tolerate. Tried fish oil & also non-fish fish oil (HA!) -- so far, all are making her vomit, so we're laying low for awhile. Trying to get some lbs. back on her after being so sick! We do coconut oil & lots of fresh, organic fruits with them both also. They eat better than anyone in the house! THANKS!